Interiors are bright and very well furnished, designed with an almost maniac care to guarantee the quality of life on board. Habitability, comfort and privacy are primary concerns The naval architects have produced an excellent hull design and a very well balanced boat. United Yacht Sales New Jersey would love to guide you through a personal showing of this 118' Custom Custom 2003. This yacht for sale is located in Genoa Italy and priced at $1,300,000. For a showing please contact us by filling out the form on this page and we will get back to you shortly! 12 guests in 5 cabins: Master, double and 2 twins 5 crew in 3 cabins Five staterooms all with ensuite bathrooms. Master stateroom with double bed on main deck and two large double VIP suites amidships as well as two twin cabins with additional Pullman berths aft, accommodating a total of 12 guests. Interior and exterior has been designed by Italian designer Patrizia Boscolo Dondi Dall'Orologi. The interior has been done in tasteful cherry wood panelling throughout the vessel. Floors are of cream-colored carpet. Bathrooms are in marble and cherry wood; the mix of the fabric and cherry wood gives the interior an elegant and classy look. SUNDECK You may access this deck from the interior, as well as from the outside stairs from the aft deck. Forward are two raised sofas, which allow guests to enjoy the ship's navigation. From here you can also manoeuvre the vessel; all navigation equipment from the wheelhouse is duplicated here. Behind these are two large fixed sun beds, well sheltered from the wind. Under the radar arch and the fixed sun awning is a large dining table, which easily accommodates 12. The aft end of the sundeck is separated from the guest area and the crane, tender and wave runner is located here. BRIDGE You access the bridge from the centre forward area of the sundeck or from the interior main deck. In the centre of the wheelhouse is the Captain's chair, in front of the helm position. On the port side there is a raised leather sofa area with a good size table for guests or crew to enjoy the navigation. Behind the Captain's chair is a large navigation table as well as the alarm and electrical panel. MAIN DECK Dual windlasses and large bollards for mooring. In the very bow is a teak seating area. On the foredeck and on the forward end of the superstructure is an additional sofa and a sun bed facing forward. The spacious master stateroom has a king size bed, writing desk and a sofa. 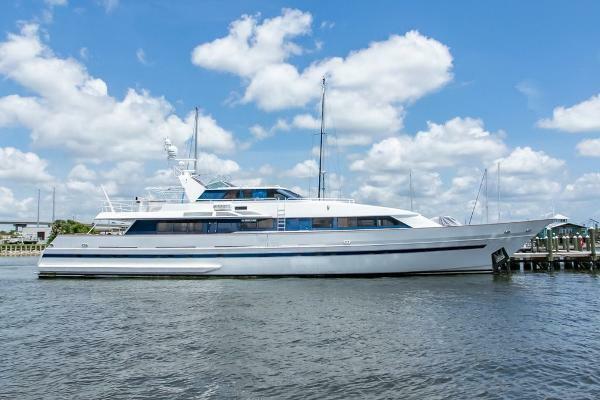 There is also a large dressing room portside and a very comfortable bathroom with a Jacuzzi bath, dual sinks, toilets and bidet on the starboard side. This cabin has large windows that allow for a lot of natural light as well as a nice view. A corridor leading aft gives access to the wheelhouse, lower accommodation area and a day toilet prior to entering the saloon. The saloon consists of a glass dining room table seating 10 guests, a comfortable sofa with a coffee table and three armchairs, as well as panoramic windows. The saloon also features state of the art stereo and TV systems. Forward of the saloon, on the portside, is a crew area which leads into the galley; this area has its own entrance from the side deck. In the aft area of the salon are the stairs to the aft accommodations. Aft of the saloon are large sliding glass doors, which gave access to the aft deck that is partly covered. here you find comfortable outdoor furniture as well as a fixed sofa. On both the port and starboard sides are steps down to the generously sized swim platform. On the port side there is also the stern hydraulic passerelle. From the aft deck you also have access to the sundeck as well as a walk around deck accessing the bow. LOWER DECK Crew area with three cabins accommodating 5 crew. 2 cabins have upper and lower bunks and one cabin has a single bunk. Midship are two well-sized double cabins with queen size beds, sofa, writing desk and large wardrobes as well as generously sized bathrooms, 1 with bathtub, 1 shower. The engine room is located aft of the forward accommodations. Aft, a small foyer leads to the two single bedded cabins; one on the portside with an office, and one on the starboard side, there is also a soundproof entrance door to the engine room. Aft is a large lazarette / storage area with a door leading out to the swim platform. COMFORT AND FUNCTIONALITY Interiors are bright and very well furnished, designed with an almost maniac care to guarantee the quality of life on board. Habitability, comfort and privacy are primary concerns and particularly the interiors were ad-hoc designed that the noise level shall never exceed 65 db in all cabins and salons. The very advanced propulsion system engineered by Deutsche MTU (engines) together with Radice (shafts and propellers) and Vulkan will ensure very low level of vibrations. SEA WORTHINESS AND NAVIGABILITY The naval architects have produced an excellent hull design and a very well balanced boat. She is stable, whilst the bow-thruster makes her easily manoeuvrable in any sea conditions. All fittings and plants have been realized aiming to a long-standing reliability. The strength of the construction is also based upon the tradition and experience of four generations of ship owning activity for ocean-going vessels. FINISHINGS The interiors are finished respecting the best tradition of Italian ebonists, specialized leaders in mega yachts; the interior designers have carefully chosen the best accessories and materials, with particular care to marble selections, wood essences, leather, draper, silk and carpets. Externally all finishings are of the best quality stainless steel, while painting is guaranteed by Boero Colours. 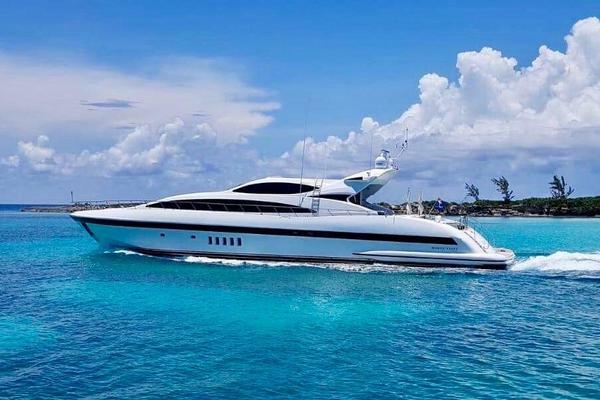 Thanks also to the luxury accesories, the more visible result is highly elegant and performing yacht, very superior to several other competitors in the same category.